‘Time’ for some science… Chops on GPS lap timing here. 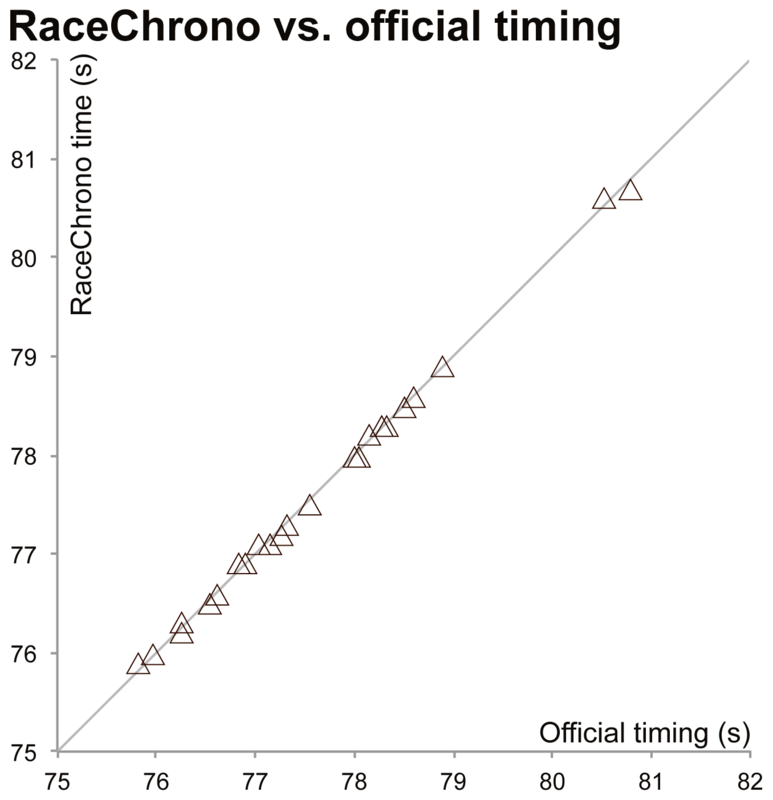 A question I’ve long wondered about is ‘how well does RaceChrono (or other GPS timers) stack up against official timing?’. 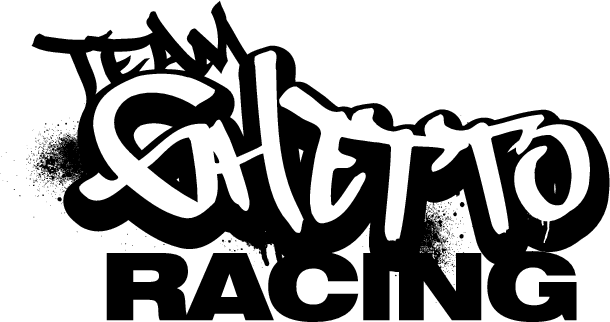 Sometimes, people come away from trackdays with incredible times from GPS based timing solutions; these times often aren’t replicated in official timing at race meetings like Natsoft, Computime or other systems. 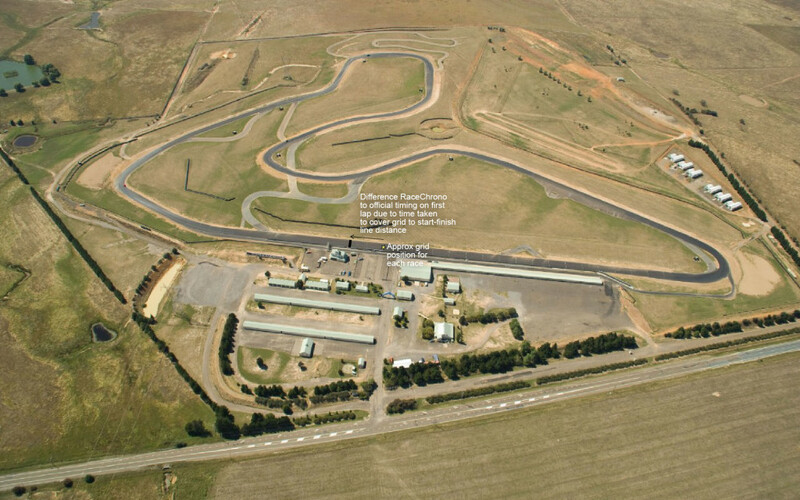 The first round of the PCRA club championships at Wakefield Park gave me a good chance to test this, so I did. I’ll add to this page as I get in more data, but here’s a first look at the data I grabbed at this first round in Feb 2015.
tl;dr version: RaceChrono compares favourably with official timing, but I can still think of situations where it might not. I don’t do anything fancy for lap timing. I use an old Bluetooth GPS (10 years old now), a Holux GR-231 which is a 1 Hz GPS. Most people recommend you use a 10 Hz GPS for this sort of stuff; I’d be interested to try one, but I can think of situations where 10 Hz will make things worse (I’ll explain more on this later) than 1 Hz. For the receiver, I use a Nokia 6120 classic, which happens to be a) cheap and b) able to run RaceChrono, at least one of the Symbian versions. There’s no reason these results wouldn’t apply to other software and hardware, though GPS receivers can vary considerably. No point discussing this, just two graphs. The first one shows all the data I was able to achieve. The second zooms into relevant laptimes rather than the couple of laps of being held up with traffic on out laps in qualifying and also ignores the race start lap times. The first thing the data tells me is, well, damn, it’s actually pretty good. The grey line is 1:1, that is, data on that line are where official timing – from Natsoft – and my RaceChrono GPS based times agree. 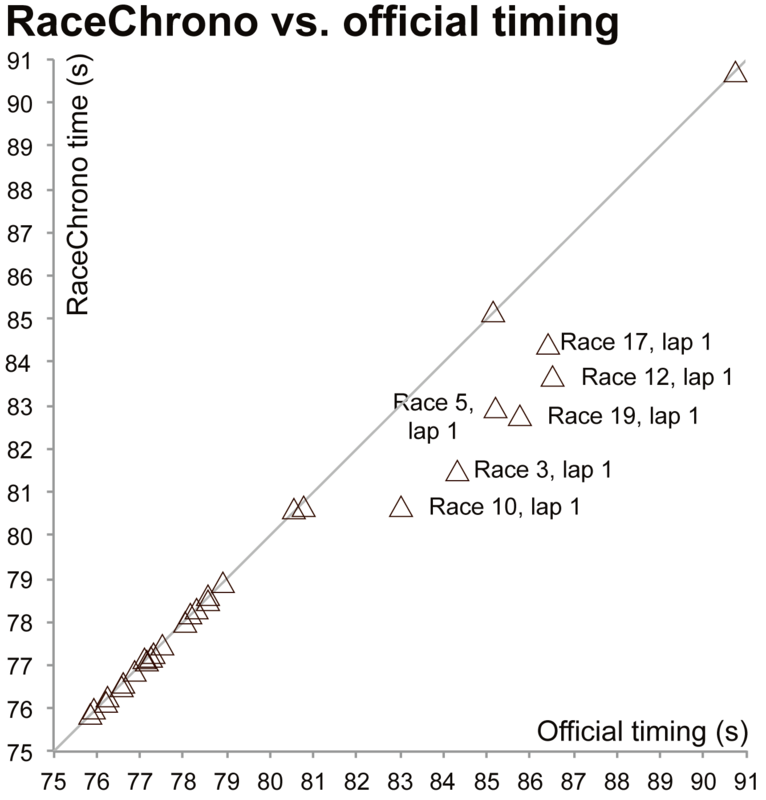 If the data points are below that line, RaceChrono thinks my laptime is faster than it was, and if it is above the line then RaceChrono thinks my laptime is slower than it was. This is the most surprising aspect for me; I was expecting a greater difference between my RaceChrono time and the official time, especially given that I am using a 1 Hz bluetooth GPS for lap timing. Then again, this also makes a little sense: every second, on average, I’m covering 27.5 m (2.2 km laps / 80 second laps). Every time the GPS updates, I am well past the previous position; remember that the GPS position on a good day with a heap of satellites is good for +/-5 m 95% of the time. If I used a 10 Hz GPS, I’d be inside that error margin for every 2 or 3 updates, which might actually make the positions and hence derived lap times worse. The second thing that’s obvious in the first graph is that, well, there’s poor agreement with race starts. This error is in the order of 2-3 seconds. This is pretty simple to understand why: my grid position isn’t right on the start-finish line at Wakefield (I started always from the 2nd row), and it takes a couple of seconds to get from grid position to the start-finish line. The official timing starts when the race starts, but RaceChrono starts my first actual lap from the moment my position crosses the start/finish line. The first couple of seconds of the first lap is contained in the out lap, which also includes the time taken to grid up etc. The first caveat is that these were optimal conditions for GPS. It was a lovely day with a beautiful clear sky. Also, at a race meeting, I actually sit still or ride slowly for a while which helps the GPS pick up as many satellites as possible. The time taken to grid up is helpful for this. I know from previous experience, going straight out on a hot lap on a trackday can result in taking a couple of laps at speed before the system picks up enough satellites to be satisfactory. The second is that it’s still no replacement for proper timing. Anyone can look at their GPS and see an awesome hot lap and tell everyone that’s what time they did, but until it’s up on Natsoft etc it’s not official. That could be the one lap where the GPS changed satellites just as you went over the start finish line, and your position moved 30 m (not unknown to happen) so you do a lap time 1.5 seconds faster than you ever have.